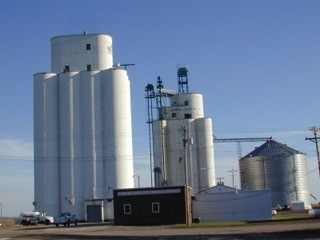 With its stepped headhouse, could the elevator in Odebolt, Iowa, be from Mayer-Osborn’s lineage? Records of the Tillotson Construction Company show no information on the grain elevator at Blencoe, Iowa. A previous post presents recent photos from Blencoe as well as delving into mysteries surrounding the Tillotson elevator and the one by Mayer-Osborn Company. Now Brad Perry volunteers his own photos from Blencoe, which is just off Interstate 29 less than an hour’s drive north of Council Bluffs. 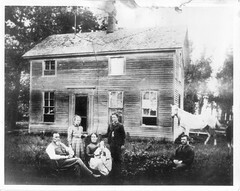 Here we see the Tillotson, with the curved headhouse, and the Mayer-Osborn, with the stepped headhouse. Supplying more photos, Brad raises an interesting question: could the elevator at Odebolt, Iowa, which is 63 miles to the northeast, be part of the Mayer-Osborn lineage? It also has a stepped headhouse. He notes that they had to have been built at the same time. It stood near the elevator of the Cracker Jack Company, which had operations in Odebolt. Brad supplies the link to a black-and-white image in the University of Iowa’s digital library. Lacking Mayer-Osborn records, we can’t say without further probing or perhaps a site visit. 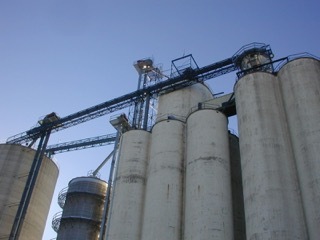 But we’re happy to pursue yet another thread in the story of our grandfathers’ grain elevators. This entry was posted in Mayer-Osborn and tagged agriculture, architecture, Business, construction, grain elevator, Iowa. Odebolt is a Mayer-Osborn elevator. Stay tuned to hear more about it.